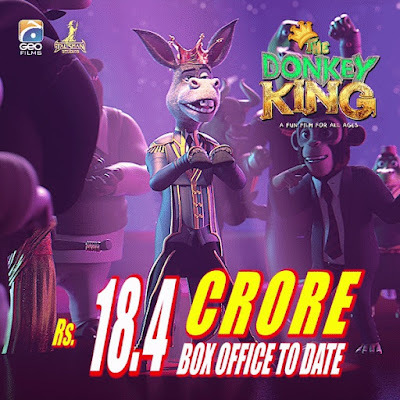 The biggest animated movie of the year, The Donkey King has been ruling the box office since its release has now become the highest grossing animated movie of the year raked in 18 Crore in total by the end of its fifth week. A film by Aziz Jindani, the architect of the success of Pakistan’s first and most popular animated super hero series for a leading antibacterial soap brand, The Donkey King has proven to be a worth watch for all ages. The wave started with the movie’s release as it surpassed 4 Crore in week one and became unstoppable as it approximately collected 1.3 Crore in the movie’s fifth week, that makes a banging total of 18 Crore. The Donkey King is the only animated movie that surpassed the benchmark of 15 Crore and is now on its way to make more money than all previous Pakistani animated films combined.